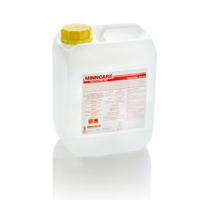 Minncare Cold Sterilant is a peracetic acid solution developed for use on reverse osmosis (RO) membranes and their associated distribution systems. Peracetic acid formulations were developed by Minntech Corporation in 1976 and are currently being used in a wide variety of applications. Mar Cor Purifi cation distributes Minncare Cold Sterilant to the Medical, Pharmaceutical and Industrial Marketplace. Protect reverse osmosis membranes and their associated distribution systems against short- and long-term bacterial problems. Minncare Cold Sterilant is a powerful oxidant that stops organism growth by oxidizing microbial cell proteins and enzyme systems and effectively removes biofilms. Minncare Cold Sterilant gently and completely cleans membranes. Minntech peracetic acid formulations have been successfully used at hundreds of locations on thin fi lm composite membranes and cellulose acetate membranes. Minncare Cold Sterilant protects employees from exposure to toxic aldehyde vapors. *Spent Minncare Cold Sterilant is acidic and requires normal neutralization as specifi ed by your state and local regulations. A 1% solution of Minncare Cold Sterilant has a pH of 3.5.